Beautiful additions to any landscape, Japanese Maples will look their best when given some protection during hot, dry summers. As the weather becomes hotter and drier, your these trees may show signs of heat stress with the development of crispy leaf edges or, as conditions get even more extreme, leaf drop. This diminishes their stunning beauty and shrivels their leaves, but fortunately, there are several ways you can minimize this problem no matter what the weather. From planting these trees in the right spot to mulching the roots appropriately to using anti-transpirants, you can shield Japanese Maples from drought-like conditions. When planting a Japanese Maple, choose a location that receives morning sun only and has some protection from strong winds. Full afternoon sun and windy conditions will quickly stress plants and reduce leaf color. Planting a Japanese Maple in front of a western or southwestern windbreak of conifers or other evergreens will provide good shielding, or plant these trees on the eastern side of the house, garage or other structure to provide that essential barrier. Mulching will help to retain moisture and cool root zones to protect these trees. 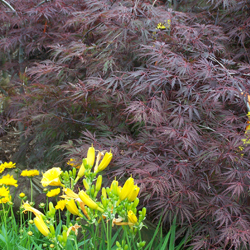 Apply 2-4 inches of mulch under your Japanese Maples, extending out to the drip line for complete protection. Be sure to keep the mulch several inches away from the tree’s trunk to avoid fungus problems and crown rot. Ideally, install a drip watering system or other slow-release watering under the mulch to retain the most moisture with less water lost to evaporation. Another way to keep your Japanese Maples looking their best is to use an anti-transpirant to helps minimize moisture loss from leaves. The best time to apply an anti-transpirant is in early summer when Japanese Maples are in peak condition, before they start showing signs of suffering from heat stress. Make your applications early in the day or on a cooler, overcast day to avoid leaf burn. Apply monthly through the hottest part of the year and your beautiful trees will look gorgeous heading into the fall season. Japanese Maples are popular landscaping trees and make stunning specimen plants in any yard, but they can be subject to heat stress that will reduce their beauty and vitality. By taking several steps to protect them, however, you can enjoy the beauty of these trees even when summers are hot and dry, and properly protected, your Japanese Maple will look brilliant throughout the summer.